Wanting to do DIY drain jetting? If a drain gets clogged, there are a large number of ways to go about dealing with it: acid, alkaline or enzymatic chemicals, drain augers or plumbers’ snakes, and more. Whilst all of these methods have their place, something more forceful may be necessary for a large blockage. That’s where drain jetting comes in. Drain jetting is a method by which a durable hose attached to a powerful water pump is pushed into the sewer, before the hydraulic force of the rear-facing jets begins to pull it forwards, cleaning out soft obstructions for up to hundreds of meters. This process has several advantages, including a long reach (so that obstructions along the length of a main sewer line can be cleared), relative ease of entry into the sewer line and removal of accumulated residue, which reduces the likelihood of future blockages and the need for repeat cleaning. When a professional is called out to provide a drain jetting service, they will uncoil the hose partway and feed it into the sewer line before switching on the pressure. A trained professional will control the feed rate and travel distance of the hose, until it reaches the end of the required cleaning area. The actual cleaning process mostly occurs when the operator begins reeling the hose back, as the backwards-facing nozzles can now form a ‘wall’ of high-pressure water that forces accumulated debris from the pipe walls and out. If the pipe is initially blocked, more than one pass may be required: one to break the blockage and one to clean the pipe. It is possible to buy drain jetting attachments for pressure washers and similar devices for home use. Whilst these methods are often better than other home options, such as cleaning fluids, they will never have the same level of performance as a professional drain jetting setup. In a professional system, the pump may be truck-mounted or mounted in a heavy wheeled carriage in order to contain the powerful pumps required for such a system. The pressures that these systems exert are often sufficient to remove hard blockages, such as tree roots, by cutting through them – something a home system cannot hope to achieve. 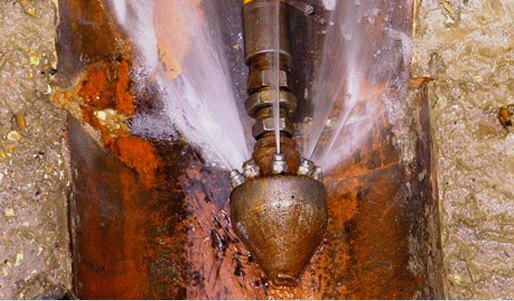 A professional system will use different jet nozzles for each pass of the drain, including some with forward and backward-facing jets for cleaning blockages, rear-only for a return pass and rotating or flail-type nozzles for a more thorough clean. In a home drain-jetting system, the pressure may not be sufficient to clean a blockage, resulting in a costly purchase combined with the cost of hiring a professional when it doesn’t work. Professional drain jetting services will require the use of protective measures, such as goggles and gloves, to prevent contact with sewage waste; a hazard that they will be insured against (an event not covered by most standard insurance policies). The high pressure exerted by the system can result in injury if operated by an untrained individual, and loss of control of the hose is possible. Whilst it’s possible to set up a basic drain-jetting system using a pressure washer, there are hazards and functional limits that you risk encountering, and the work will never be completely effective. In general, such a task is infrequent enough that hiring a professional, such as the experts at Express Drainage Solutions, is always the best option. This article was posted in Guest Posts. Bookmark the permalink. Follow comments with the RSS feed for this post.Post a Comment or leave a trackback: Trackback URL. Need a Builder or Tradesman? Post your job with us and we will get local tradespeople to contact you. © 2019 FindaTrade Blog. All Rights Reserved.